Choice lustrous terminated reddish-brown crystals of hubnerite are set on a small sparkling colorless crystallized quartz matrix. 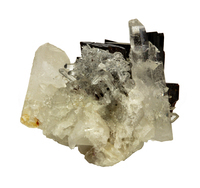 No damage - the back of the hubnerite crystal cluster is completely covered by quartz. Size: 2.8 x 2.3 x 2.2 cm. Sits perfectly for display by itself. Ex Lloyd Tate collection. 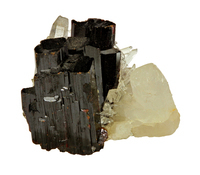 Ref: The Mineralogical Record: 28: 29-36.